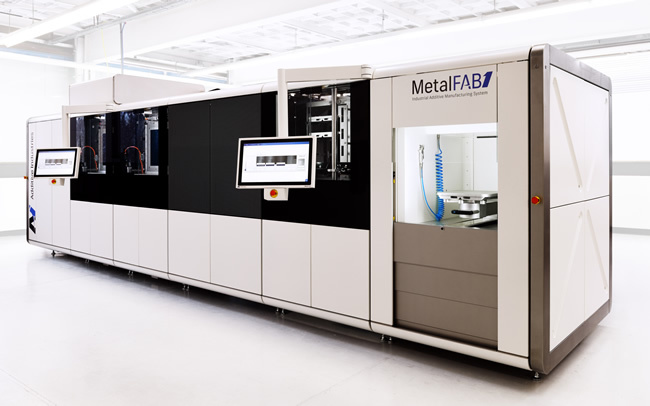 Taufkirchen (D)/Eindhoven (NL), April 21, 2016 – Additive Industries has handed over its first industrial 3D metal printing system, MetalFAB1, to Airbus APWorks, a 100 % subsidiary of Airbus Group. APWorks will start testing the integrated system and corresponding Additive World software platform for series production of industrial parts for its customers in robotics, mechanical engineering, automotive, medical technology and aerospace. As part of the MetalFAB1 Beta programme, APWorks will thoroughly evaluate the processes and applications for multiple materials simultaneously to officially validate and certify the process for the most critical parts. As a 100 % subsidiary of the Airbus Group, APWorks is familiar with modern production processes, and makes proven aerospace technologies accessible in many different industries. In metallic 3D printing or additive manufacturing they cover the entire value chain, from optimized component design to the choice of suitable materials, from prototyping to qualified serial production. Their customers in robotics, mechanical engineering, automotive, medical technology and aerospace benefit from all the advantages that additive manufacture has to offer – the shortest possible production times, lower weight and lower materials consumption. 3D printing also allows much more complex geometries than were previously possible. In addition to additive manufacturing, APWorks markets innovative projects and technologies from Airbus Group Innovations. This entry was posted in News and tagged Additive Industries, Airbus APWorks, Airbus Group, Daan Kersten, Joachim Zettler, MetalFAB1 by AM. Bookmark the permalink.